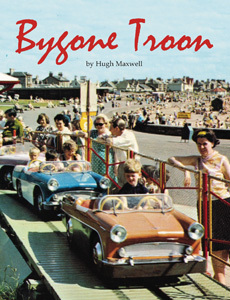 The douce Ayrshire seaside town of Troon today is a desirable place to live, with a large beach, good shops and clean, wide streets and has fared well as a resort thanks to its upmarket offer including several golf courses. However, it started life as an industrial port when Ayrshire’s heavy industries exploded with growth in the 19th century and added its own like the Ailsa Shipyard which is included in this illustrated history of the town. By 1900 leisure was as important as the shipyard and the harbour. Summer territorial camps at or by the town turned the necessary annual training into a form of holiday for the men involved. This well-captioned collection of photos shows all these aspects – the harbour and the shipyard at work and the summer visitors at play. The ‘suburbs’ of Loans and Barassie are also included.